Finishing 3D printed parts: Which option should you choose for your project? When you create an object with 3D printing, you want it to be perfect, to have the highest surface quality and to be as much resistant as possible. Since the 3D printing technology is building the final object layer-by-layer, the surface of the 3D printed part may result to be a bit rough. In order to avoid the appearance of the layer effect, we recommend you to apply a 3D printing finish on the exterior surface of your parts. But how to choose the right 3D printing finish according to your priorities? There are many things to consider for applying the right finishing option: the compatible materials, their resistance for different uses, the price etc.. In this blog post, we will go through all the 3D printing finishes we offer through our online 3D printing service. We will describe their properties as detailed as possible and see how each one can be used for different purposes, so you can find the one that suits you best! The “Smoothing Beautifier” is a patented process that was developed by the R&D department of Sculpteo. This finishing option can be applied on your white plastics and your white plastics dyed in black. Thanks to this finish, your 3D printed parts get exceptionally shiny and more performant, so that they look like finished products. Our “Smoothing Beautifier” is the perfect choice to make your products very shiny and smooth in terms of “look and feel” and it will also make them waterproof. As explained in our recent test among some of our 3D printed plastics, the “Smoothing Beautifier” finish is more water-resistant than other plastics. Thus, it is one of the finishing options that are dedicated to outdoor activities and can be exposed to humid environments. Both the “Color Touch” and “Color Resist” finishes are dyeing finishes achieved with the DyeMansion technology and you can apply them on your Nylon PA 12 plastic parts and your HP Multijet Fusion PA12 plastic parts. There are 14 available colors for dyeing your Nylon PA 12 parts: blue, black, red, green, orange, yellow, brown, pink, white, violet, navy, bordeaux, anthracite and stone gray. The only color of the Color Touch finish you can apply on your HP Multijet Fusion parts is black. Obviously, the range of available colors is much wider than in the traditional dyeing process. Moreover, the maximum size for dyeing your models with the “Color Touch” finish is bigger than dyeing them with the simple dyeing process (284 x 350 x 350 mm for the MultiJet Fusion parts and 675 x 366 x 545 mm for the White Nylon PA12 parts). Let’s see how each one of them can fit your 3D printing needs. 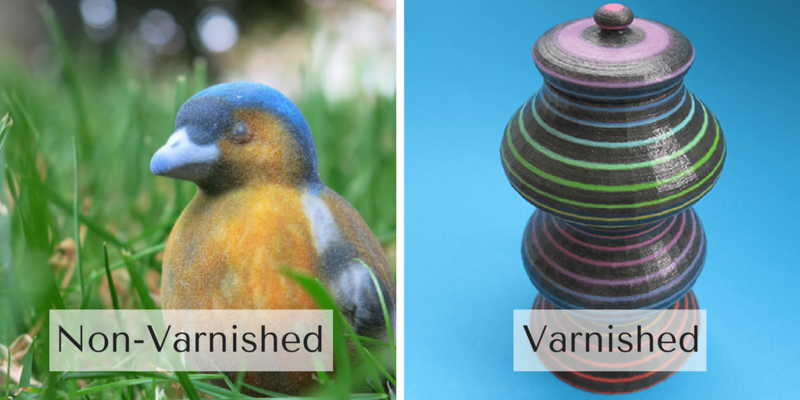 Why should you apply the “Color Touch” finish on your 3D printed plastics? “Color Touch” is a great option if you want to give your dyed parts a satin look. Thanks to the special post-printing treatment we follow at Sculpteo, which includes tribo finishing both before and after the dyeing process, the surface of your 3D printed parts gets bright. “Color Touch” should be a choice to consider when you are looking for a shiny and colorful option to withstand scratching and rubbing on a daily basis. Moreover, it is resistant enough to be exposed to external conditions, as on top of all of that it’s also UV resistant and helps the color to remain stable over time. For these reasons, many of our customers choose this finish to apply it on glasses, fashion products, jewelry, decorative products and more. 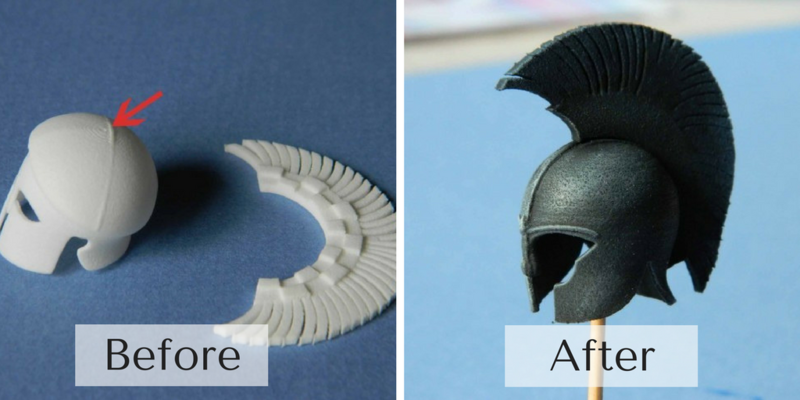 Why should you apply the “Color Resist” finish on your 3D printed plastics? The “Color Resist” finish is the solution for applications requiring high levels of resistance to wear. As the name of the finish implies, this finishing option gives your 3D printed plastics a matte look that is very resistant to scratching, friction and abrasion. It also gives a high-quality surface, so that it can be exposed to outdoor use or mechanical parts that need to be resistant to rubbing. In addition, you can use the “Color Resist” finish for parts that need to have the same color between different production batches, which is great if you need to produce an important amount of identical parts. Parts produced with the Binder Jetting technology (Steel / Bronze 420SS/BR and Stainless Steel 316). Through the polishing procedure, your parts get a smoother surface, so that the layers are not so visible and the surface is not so rough. 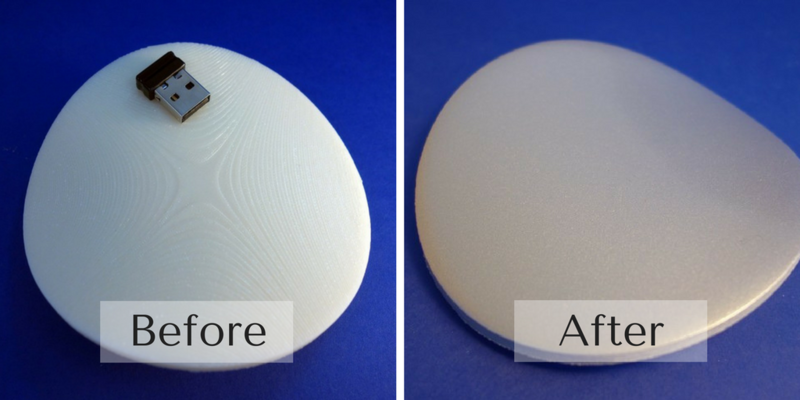 It is the most affordable choice after the “raw” option and as you can see from the image below it significantly improves the surface quality of your 3D printed parts. Varnishing is a finish that is applied to the parts created with the Colorjet 3D printing technology and the white Nylon PA 12 parts. It is a great finish to apply on figurines created with the MultiColor material as they make them look shinier. It can be also applied on top of a painted plastic, meaning that for every painting color available for white plastic, you varnish them on top (glossy painting). It is an excellent choice to consider for your plastic or multicolor parts if you want to protect them from humidity, and give them a glossy and shiny surface too. 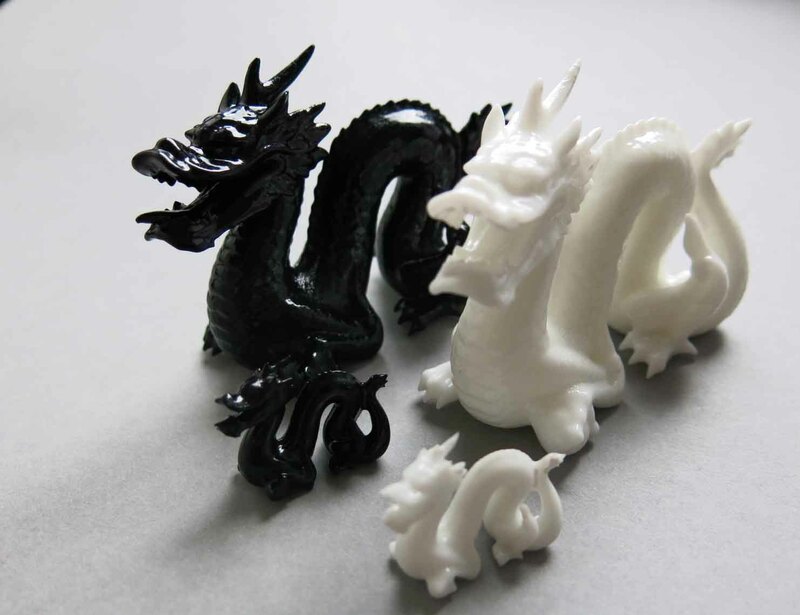 Dyeing can be applied on your White Plastics, on Alumide and on black Polyjet Resin. 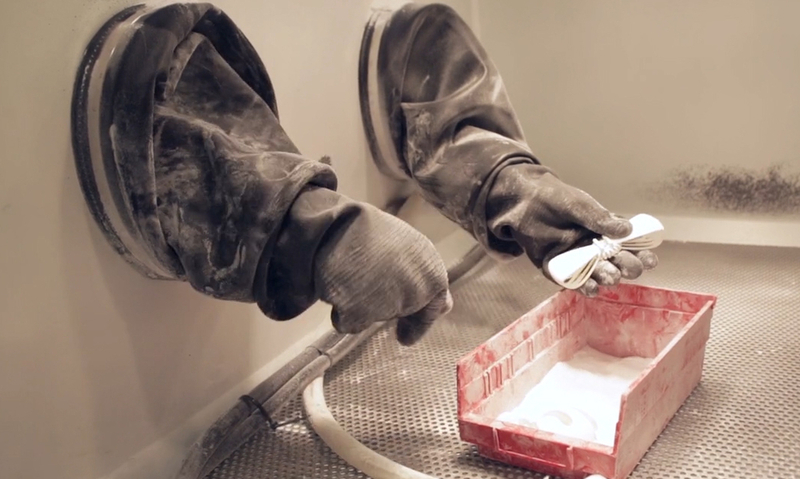 The procedure of dyeing your 3D Printed parts consists of immersing them in a heated dye bath. Thus, the color reaches all the sides of the parts, the internal channels and the interior surfaces, resulting in a uniform finish. Dyeing is a great option to consider for parts of great geometrical complexity that cannot be painted. It is also a more affordable solution than “Color Resist” and “Color Touch” options, for a more limited range of colors. Painting is an option that you can consider finishing 3d printed parts made of white Nylon PA 12. Your plastic parts are painted with a spray-gun. Because of that, painting is a great choice as it enables paint to maintain the details of the printed object (the paint layer only adds 200 microns of thickness on average). For every color, there are two different options to choose from: either glossy or matte. The result is a smooth and uniform colored surface, that is perfect for prototypes, decorative objects and demo products. Through Sculpteo online 3D printing service you can also 3D print a wide range of metals. 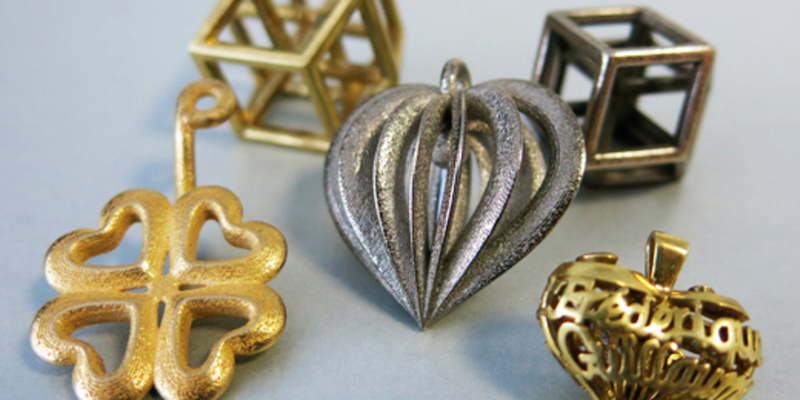 A very common use of metal 3D printing is actually for creating jewelry, fashion items and decorative parts. Since metals oxidize when exposed to air, we provide various plating options for metals for preventing this. All of our plating options are skin safe, so they won’t cause any harm when you wear them on as jewelry. So, which plating option should you choose for your metals? If you are using our Steel / Bronze 420SS/BR 3D printing material, you have access to three available plating options: Gold plating, Nickel Plating and Black Damascus. The maximum component size for plating this material is 177.8 x 177.8 x 177.8 mm and the minimum is 0.3 x 1.27 x 0.8 mm. For both options we use 24 karats plating, so your 3D printed parts get a shiny and elegant surface, that looks like precious jewelry. In case you are using our Brass 3D printing material to create your customized jewelry, you can choose among 4 different plating options: White Rhodium finish, Black Rhodium finish, Gold plating and Pink Gold plating. The maximum component size for plating this material is 88 x 88 x 120 mm and there is no minimum limitation. As brass is oxidized in air, especially in humid conditions, you can use any of these finishing options against surface color alteration. Each one of the finishes give your brass parts a shiny silver, black, gold or pink gold surface, so that your jewelry parts get pretty and elegant, as you can see in the following pictures. A smart way to reduce your 3D printing cost is to post-process some of your 3D parts yourself. Of course this is not a possibility for all the 3D printing materials, but only for Polyamide and Resin materials. Let’s see how it can be done! It is very easy to post-process your 3D printed parts in order to turn them from prototypes to actual production objects! In a few steps only, you can smooth the surface of your 3D printed parts, using a few tools, such as sandpaper, primer, spray paint, glossy/matte Varnish, safety mask and goggles. Check out this tutorial, to see how you can post-process your Nylon and white Resin 3D parts, only in a few steps! This tutorial is about post-processing parts made from Translucent PolyJet Resin, which is a material ideal for creating transparent objects. With our tips for polishing your parts, you will totally eliminate the effect of the layers that you could possibly observe on the material’s surface, so as to achieve the perfect transparent result for your parts! 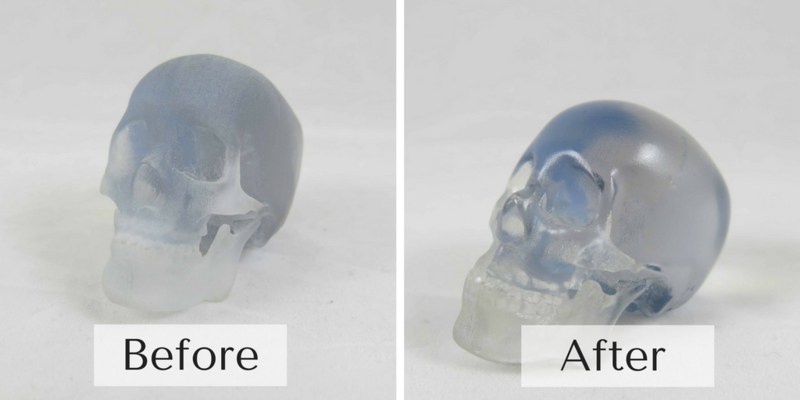 Even if you have no prior experience in 3D printing and post-processing of 3D printed parts, with these very simple guidelines you can polish your translucent resin 3D prints to make great fully transparent products! Do you already feel motivated for 3D printing and finishing some parts? All you have to do is to upload your 3D model on our online 3D printing service and we will deliver it to you!